There are lots of smartphone apps are available in the market which allows you to recognize your voice and controls the apps. One of the best example is Siri for iphone 4S, Siri on iPhone 4S lets you use your voice to send messages, make calls, set reminders, and more. And for Android you can also use the Siri Clone Iris, Iris allows you to search on various subjects including conversions, art, literature, history, and biology. You can ask it any question and it will reply you. But all these app needs Internet connection, WiFi or 3G to run. 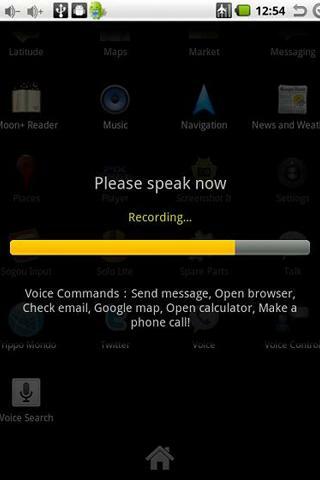 But with Voice Control without internet Android app you can do all thsi locally without internet connection. Voice Control is new android app, which allows you to launch apps on your device via voice commands without requiring any internet access whatsoever. This Android application is simply made to test that speech recognition can work fully on all android phones without any help from a server. Currently supported speech commands are: Send message, Open browser, Check email, Google map, Open calculator, Make a phone call!